"IT IS FINISHED WHEN SEVEN ARE ONE" | The most frequently asked about symbol from Holy Wood which, as all others, was the first to be outlined by The NACHTKABARETT. It is a depiction of the essence of alchemy and Kabbalah and is a microcosm of the both pursuits' ultimate goal of attaiment; the transformation and ascendence of the soul into the realm of the Gods. SATURN DEVOURING HIS CHILDREN - THE NOBODIES | Saturn in most mythologies is associated with evil and maligned forces. In the Tarot Saturn represents the Death card. In Greek mythology he is the God who devoured his children in fear that one day he will be overthrown by his son. 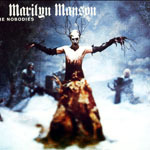 More insidious in connotations than Mercury whom Manson identified with on Holy Wood, emblems depicting Saturn are within the album artwork and is who Manson portrayed as within the video for 'The Nobodies'. 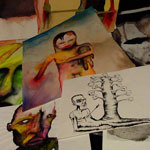 THE ALCHEMICAL TREE | First hinted at via a website Journal post by Manson in 2002 revealing several new drawings and watercolors, the surreal and almost comic depiction of a man in repose with a tree growing out of his lower torso (Freudian connotations intact) is a sketch by Manson, originally from a 16th Century alchemical source. THE BLOODSTAINED EGG & THE EDEN EYE "Burned all the good things in the Eden Eye, Too dumb to run too dead to die" / "Her heart's a bloodstained egg, We didn't handle with care. It's broken and bleeding, and we can never repair." 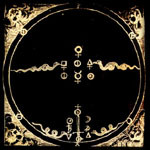 Lyrics of 'Coma Black' on Holy Wood and presented are the various related alchemical emblems which appear within the album artwork which are representative of the lyrics. THE GOLD LION & THE VITRIOL OF THE WISE | Two of the more obscure symbols within the Holy Wood album artwork, their origins, sources and symbolic meanings detailed here. THE ALCHEMICAL MARRIAGE OF MARILYN MANSON & DITA VON TEESE | Conducted by, Alejandro Jodorowsky, one of Manson's biggest inspirations. This ceremony and thereby the role of Jodorowsky, becomes the symbolic representation of the Alchemical union of two into one. 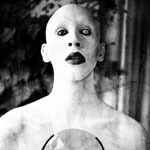 Manson has referenced alchemy all throughout his body of work, as well as taking queue and influence from Jodorowsky's filmography, most notably in terms of personal transformation and evolution, however with the wedding illustrating a new theme; the union of opposites and the symbolic amalgamation of the two halves. The very concept illustrated by the name 'Marilyn Manson'. 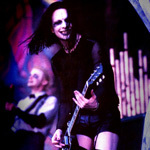 ZIM ZUM | Antichrist Svperstar was Manson's first era and album to not only embrace but to openly evoke the occult and Kabbalah, with Donald Tyson's book, 'Tetragrammaton: The Secret Key to Evoking Angelic Powers & the Key to the Apocalypse', even cited in Manson's autobiography as being read during the album's creation to denote the large forthcoming influence. Zim Zum was the live guitarist for Antichrist Svperstar and was a member of the band between late 1996 to mid 1998. He was the first member ever to join the band at that time who had not been endowed with a supermodel/serial killer dichotomy for a name. Instead Zim Zum was invited to join the band under a title which is a Kabbalistic term denoting the absence of God's presence. THE VACUUM OF INFINITE SPACE ENCOMPASSING | The symbolism is one relating back to John Milton's epic poem 'Paradise Lost' in which the fallen angel Satan acts as the story's protagonist, who defies God and wages war upon Heaven; a subtle but periodic source of inspitation utilized by Manson. 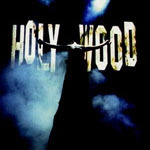 GOD EAT GOD - THE DAWN OF HOLY WOOD | December 15th, 1999 marks the dawn of Holy Wood. 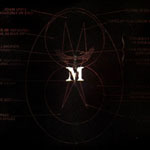 Unveiled on MarilynManson.com on the 30 year anniversery of a pivotal point of establishing evidence of guilt during Charles Manson murder trial, the discovery of the bloodied clothes worn during the killing, the title of the forthcoming album was revealed as well as a brand new website to chronicle the occult influences of the forthcoming era. MERCURY & THE ANDROGYNE | The identity which Manson adopted during 'Holy Wood', as well as the Triptych containing its predecossors 'Mechanical Animals' and 'Antichrist Svperstar'. 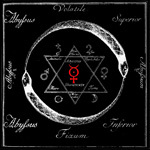 Mercury is the key element in alchemy which is said to yield the fabled Philosopher's Stone and is the planetary element which bears the influence of artistic and poet flair. Its equivalent in Greek mythology is the God Hermes who is known as "The Messenger of the Gods". 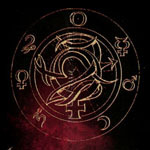 The Androgyne is a symbol of alchemical balance, Male & Female; Black & White; Marilyn & Manson, and thus a symbol of the transformation and evolution which The Triptych represents. ADAM KADMON, 'THE FALL' &AMP; 'OF RED EARTH' | As can be seen within the artwork of Holy Wood, one aspect of the story Manson set out to illustrate with the parable of Holy Wood was told by his personification of 'Adam Kadmon' who, in Kabbalistic tradition, is the Adam of the Garden of Eden, the first and iconic man. 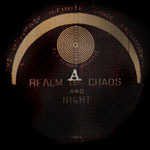 The four sections of the album are delineated each with letters which spell out 'ADAM', likewise was seen within the menu design of MarilynManson.com during this era as well as subtle references within the lyrics. CRUCI-FICTION IN SPACE | One of the most signature tracks on Holy Wood whose origins are inspired from various aged esoteric texts and which was enacted onstage during the 'Guns, God & Goverment Tour' in support of the album bearing the song. 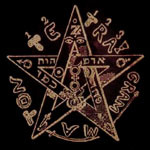 THE TETRAGRAMMATON | The cryptic symbols within Holy Wood and Antichrist Svperstar all relate back to this core. Tetragrammaton is a Greek word meaning 'The Four Lettered Name of God', IHVH as found in the original Latin scriptures of the Holy Bible. It is a key force evoked and drawn upon within the occult and the title of the book Manson revealed in his autobiography as being inspirational throughout the recording of Antichrist Svperstar.